It almost feels like cosmic symmetry that a café whose clean-cut interiors are inspired by Alvar Aalto should debut in David Chipperfield’s first project in South Korea. 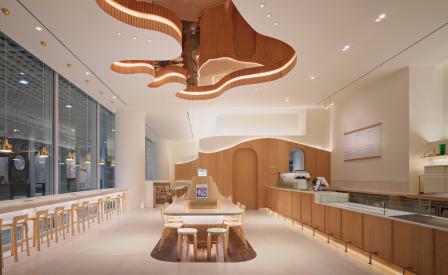 Set in Seoul’s transformed Yongsan-gu district, the straight lines of the English architect’s striated cubed skyscraper are quietly semaphored in the café’s interiors. Here, Teoyang Studio has installed thinly slatted birch screens that frame a deep-set cut-out ceiling to recall Aalto’s Savoy Vase, whilst diners perch stylishly on the iconic Stool 60 and Chair 66. A central reading table stocked with volumes on Finnish architecture is the ideal spot to sample the café’s offerings which are conceptualised by local bakery Mealdo. Pastry chef Ick-beom Jeon bakes crispy honeyed rusks with vanilla alongside fragrant bread loaves, and jams, whilst giving even the quotidian coffee an Aalto makeover with fresh chestnut cream, its woodsy hue an homage to the Finnish architect’s love for the beech tree.